April is the main month for Squirrel problems in lofts. The colder the month the more squirrel problems there are in lofts in April there are. The reason for this is that squirrels will be looking for a safe warm place to have their young. Squirrels will have several ‘dreys’ or nests within their territory. Most will be natural nests in trees but some will be man made cavities such as lofts. This should never be done before the family squirrel has been eliminated. If holes are blocked with the members of the family still alive then they will do their utmost to get into their ‘home’ and may cause damage in the process. While it is essential that the access holes are blocked, it should only be done AFTER the present infestation has been eliminated. Squirrels are difficult to control. Not many companies offer guaranteed pest control treatments for squirrels in April. PESTUK do. For a fixed price of £135 + VAT (£162 inc) PESTUK guarantee to eliminate your present squirrel problem no matter how many visits it takes. Generally it can take between 2 and 4 visits depending on circumstances. We use a combination of traps and poisons, again depending on circumstances. 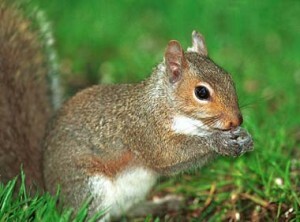 Due to bird feeding and other food sources available squirrels will often not take poison. The PESTUK technicians will often put chocolate and peanut to the poison mix to make the poison more attractive. 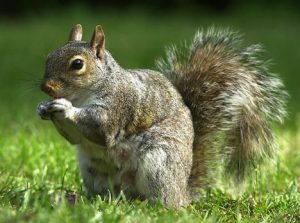 Squirrels in April cause damage to bulbs, trees, plants but more worryingly birds, birds eggs and their nests are destroyed by squirrels. They may look cute but kill baby birds. Feeding birds encourages squirrels and increases the population density as with a regular food supply the squirrel’s territory does not have to be so large. For any advice on Squirrels in April or any other pest control matter then please call PESTUK on 0800 026 0308 (free from landlines & most boils) or 0330 100 2811 (local rate).